The possibility of directly controlling quantum states may be important for possible future quantum computers. Superconductivity and magnetic fields are normally seen as rivals – very strong magnetic fields normally destroy the superconducting state. Physicists at the Paul Scherrer Institute have now demonstrated that a novel superconducting state is only created in the material CeCoIn5 when there are strong external magnetic fields. This state can then be manipulated by modifying the field direction. The material is already superconducting in weaker fields, too. In strong fields, however, an additional second superconducting state is created which means that there are two different superconducting states at the same time in the same material. The new state is coupled with an anti-ferromagnetic order that appears simultaneously with the field. The anti-ferromagnetic order from whose properties the researchers have deduced the the existence of the superconducting state was detected with neutrons at PSI and at the Institut Laue-Langevin in Grenoble. The findings were published in the scientific journal Nature Physics. The material CeCoIn5 is superconducting at very low temperatures. As expected, superconductivity is destroyed in the presence of very strong magnetic fields (in the case of this material above 12 Tesla). 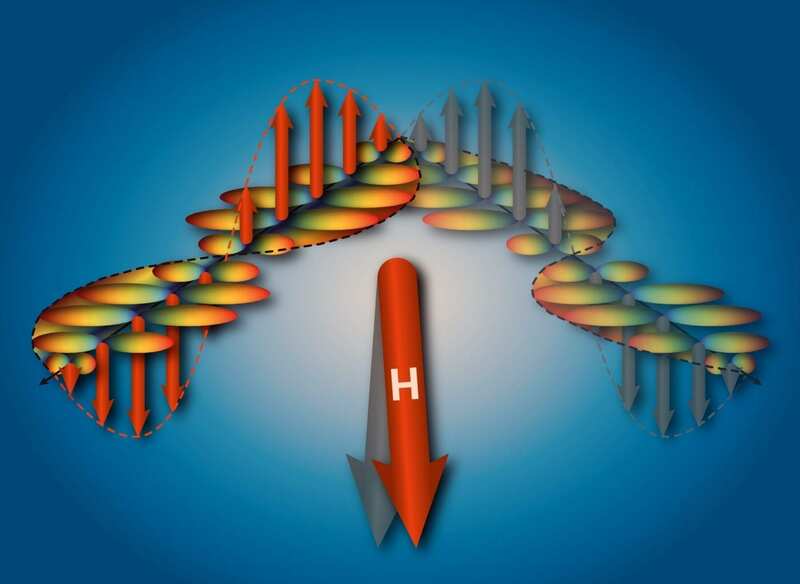 Researchers at the Paul Scherrer Institute have now demonstrated that before this happens, a new exotic state of the material is created in strong magnetic fields. In this state, an additional antiferromagnetic order is observed in addition to superconductivity, i.e. the magnetic moments (the “elementary magnets”) in the material partly point in one direction and partly in the opposite direction in a regular manner. Symmetry arguments lead to the conclusion that a novel quantum state must be linked to this magnetic order. PSI researchers have examined the properties of this antiferromagnetic order and concluded that this novel quantum state corresponds to a second, independent superconducting state. Superconductivity occurs when electrons come together in a material in Cooper pairs that can move unimpeded through the material. From the Cooper pair perspective, there are different types of superconductivity which differ particularly in terms of the symmetry properties of the movement of the Cooper pairs. In the material examined here, there is a second superconducting state in addition to the already existing one. To use technical jargon, initially there is d-wave superconductivity which is joined in the exotic state by p-wave superconductivity. The antiferromagnetic order in the material was detected in neutron experiments at PSI’s neutron source SINQ and at the Institut Laue-Langevin in Grenoble. In these experiments, a neutron beam passes through the material and then the investigators observe in which directions large numbers of neutrons are scattered. This permits conclusions about regular structures inside the material. In this case, an additional direction emerged in which many neutrons were diffracted at high magnetic fields. This corresponded to the antiferromagnetic order or, to be precise to a spin density wave. That means when you move in a certain direction through the material, the magnetic moments first point in one direction, become larger and then smaller and then point in the opposite direction, become bigger and then smaller again etc. If you draw the moments as arrows then their tips can be joined by a wave line. In this material, the spin density waves can only run in two directions that are perpendicular to one another, i.e. they can appear in two different domains. The direction in which the spin density wave moves depends on the direction of the external magnetic field. When the direction of the magnetic field is altered, then for a specific direction the orientation of the spin density wave also changes abruptly. To prove this effect, the researchers built a special sample holder by means of which the sample could be tilted by very small degrees between the measurements. “The observed behaviour of the material was completely unexpected and is certainly not a purely magnetic effect”, explains Michel Kenzelmann, head of the PSI research team. “This is a clear indication that in the material the new superconducting state occurs together with the spin density wave, as is also expected from symmetry arguments.” The special feature of this state is that it is very closely linked to the magnetic order. This means that they both become stronger when the strength of the outer magnetic field is increased. Hence, by means of the external magnetic field, one can directly control the quantum state which is linked to superconductivity. The possibility of directly controlling quantum states may be important for possible future quantum computers.